5. Thank you for reading! Children love telling stories about the whimsical adventures of fairies... That’s because children don't know that most fairies are spiteful jerks. And in the world of spiteful fairies there are few names spoken of with more contempt than Mireska Sunbreeze. This is the fourth guide I've ever created and I wanted to start with a short introduction about myself and the hero featured in this guide, Mireska Sunbreeze, the Dark Willow. Right now I have over 3.500 hours played and I'm trying my best to climb up my MMR, currently sitting at about 5.000 MMR. I've used to play competitively years ago in some amateur 6.000 - 7.000 MMR teams and didn't focus too much on ranked matchmaking at the time, so hopefully whenever I have the chance to play I'll be able to improve more! Alright, enough information about myself, let's go back to Dark Willow! She's one of the newest additions to the game together with Pangolier and she's frequently picked across all skill levels and even in pro matches. When to pick Dark Willow? Taking all of the above into consideration, you should pick Dark Willow when your team needs an aggressive support that can deal burst damage, disable multiple enemies and efficiently set up kills especially in the early game. Thanks to her long range abilities, she's able to harass enemies safely and take part in team fights from a distance enabling her to do as much damage as possible with a low risk of getting killed. Since all of Dark Willow's power comes from her abilities, make sure to pick her when the enemy teams lack silences. You can have a huge impact in fights if you're not disabled and having this in mind even before the picks have been made will surely help. However, if you have to deal with multiple ability silences or item silences, remember that you can counter this in various ways, for example by positioning yourself accordingly or by purchasing Eul's Scepter of Divinity, be creative! 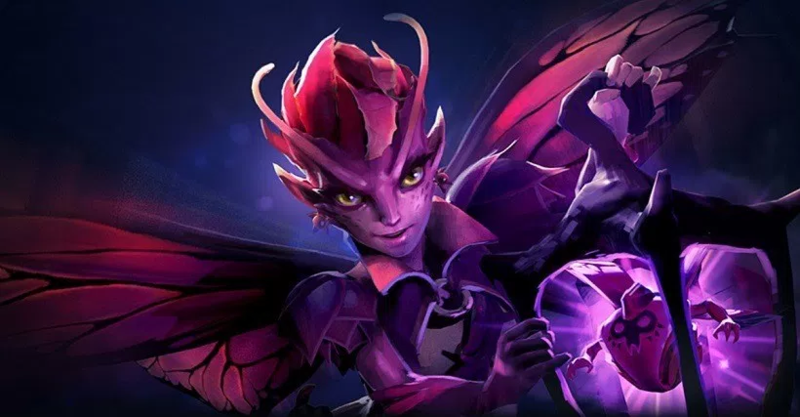 If the enemies have picked heroes that naturally are great at dealing with magic abilities or tend to build a Black King Bar, you have two aspects to keep in mind if you want to pick Dark Willow. Remember that magic immunity counters all of her abilities, so you're going to have to deal with your enemies when you're the strongest, and that's usually in the early - mid game when they don't have their Black King Bars up and running. However, if you're having a rough game and the enemy heroes are strong in terms of magic resistance and immunity, as mentioned before, make sure to properly position yourself in fights and to use your abilities to their full potential, they have long cooldowns so they shouldn't be misused! Her abilities are very versatile, they can be used both offensive and defensive. For instance, Bramble Maze can be used for chasing enemies, disrupting team fights and locking down a specific area of the fight, but also for blocking escape pathways of your enemies or pathways for your allies to safely flee. Shadow Realm can be used as an escape mechanism or as a way to delay your death to save time until your allies come to your aid or secure an objective. Cursed Crown can be used to isolate an enemy hero, since they're going to have to move away from their teammates to not get them stunned as well. And of course, her ultimate is really strong in tight team fights both when you want to retreat or when you simply want to disrupt your enemies. Alright, let's discuss the skill build displayed above. The skill build that we're going to talk about is the one I found the most effective, but feel free to make adjustments to your liking. I like to follow the standard 1 - 1 - 1 start with a point each in Bramble Maze, Shadow Realm and Cursed Crown. This is great because all of Dark Willow's abilities are strong in the early game and we will most certainly encounter situations in which we need all of her abilities to be available for use. Bramble Maze is going to be key in disabling your enemies early on, Shadow Realm will be your damage output and escape mechanism, and Cursed Crown will help isolate enemies and it's a pretty great follow up to other disables. The first ability that I prefer to max out is Shadow Realm. At level 7 you're going to have an ability that deals 360 nuke damage that has only 12 seconds cooldown with a relatively low mana cost, what could be better? Let's not forget the fact that you can cast Shadow Realm from 1075 range since it increases your attack range by 600. Moving on, I believe it's best to max out Bramble Maze instead of Cursed Crown. Even though Cursed Crown's stun is awesome, it's not really that reliable and the extra points in Bramble Maze early are more effective. By the time team fights will start to happen you're already going to have some good points put into Bramble Maze. Remember that Bramble Maze can root enemies multiple times and the damage is not to be ignored. Another important aspect is that Bramble Maze's cooldown at level 1 is 40 seconds which is a really long cooldown for a basic ability, so the extra points will reduce the cooldown to up to 25 seconds, meaning you'll be able to use Bramble Maze more and not stress yourself too much if you've misused it at any point. And yes, of course, always put a point into your ultimate whenever you have the chance! Okay, let's move on to Dark Willow's talents and which options are the strongest. At level 10 we have to choose between +125 cast range and +20 damage. Since you're going to focus mostly on your abilities and not on regular attacks, I believe the best pick here is the +125 cast range. You're going to be able to cast your abilities AND items from even farther away, awesome! At level 15 we have to pick between +40 movement speed and +90 gold/min. These are two great talents and it's difficult to choose between them. I would say in most of the cases it's better to pick the gold increase per minute, it's going to help you afford support items and build more items. However, if you're having a good game in terms of gold or if you simply feel the need of more mobility, go for the movement speed talent instead. At level 20 we have to pick between +300 Shadow Realm max damage and 10% spell lifesteal. As tempting as the spell lifesteal sounds, I don't think it's that great since you're going to position yourself behind your team and cast your abilities from a distance, meaning you'll be safe and you won't benefit from the lifesteal that much. The +300 damage increase for Shadow Realm fits well though since it will make your nuking potential even stronger. Time to blow up heroes! And now the final pick, the level 25 talent! We have to pick between +1s Terrorize duration and +200 attack speed. Well, this one is pretty obvious, since Dark Willow won't be dealing damage with her regular attacks, the increase in attack speed won't really help. The extra second of Terrorize means you're going to have a total of 5 seconds of disable coming only from your ultimate, that's convenient and really scary for your enemies. Should be enough to provide you with early regeneration, make sure to give 2 tangos to the mid player if he needs them. Since you're going to use your abilities actively while helping your team, you're going to need some mana regeneration to avoid going back to base after using all your mana. The item that can win games, the Observer Ward. Always pick it up at the beginning of the match and place it in a spot that can help your lane or your mid player. Usually I place it where it can scout one of the runes while also providing vision for my carry and mid player, it's important for them to be safe. Don't forget that wards can also be used offensively, if your teammates are safe enough and you're confident you can get something done, feel free to plant them in the enemy territory. Also, try to find spots that aren't too obvious, it's important not to get your wards removed. Besides losing vision and gold, your enemy is also earning gold for the ward kill. This item is essential against invisible enemy heroes and also for removing the enemy Observer Wards. Vision is crucial and it can decide the outcome of the match, so make sure to always have Sentry Wards on you if needed. I like to pick up one early in case I see where the enemies have placed their starting wards; they're a must against heroes like Riki in the early game. Some extra movement speed for the early game to boost your mobility. Can be upgraded later into Eul's Scepter of Divinity or Spirit Vessel. Grants movement speed and increases your mana pool. Good source of quick mana for you and your teammates. Can be disassembled to build Aether Lense. A wonderful item to always keep you up and running. Provides you with some extra stats and can save you in a lot of situations if you have enough charges. It's a great item against spell spammers such as Bristleback, Batrider, Phantom Assassin and so on, it's proven to be a real clutch item in fights for me very often. Grants intelligence, amplifies your spells and reduces abilities mana cost. Wonderful item for every dedicated spell caster, make sure to pick it up! Increases your cast range, mana pool and mana regeneration. Great synergy with your abilities and in combination with the +125 cast range talent. Use the Energy Booster from Arcane Boots to build this item. A versatile item that can be used both defensively and offensively while also increasing your durability. It can be used on enemies to decrease their armor and make them easier to get hit by auto attacks, or you can use it on your allies to increase their armor and grant them evasion. Great item in combination with strong physical damage dealing allies and for melting the armor of the enemies. Not very costly, this item can be of great value since it enables you to save yourself or your teammates while also forcing the enemies to spend gold on true sight items. Buy this instead of Blink Dagger if you think it's better. Usually it's more efficient against heroes like Clockwerk and heroes that can easily disable your Blink Dagger. It can also be used to save your teammates or to get your enemies out of position. Bonus intelligence, movement speed and mana regeneration. Useful item to catch fleeing allies, cancel teleportation, or simply avoid enemy spells or remove debuffs such as silences. Can be built using the Wind Lace from the starting items. More mobility, more versatility, better positioning! Make sure to pick this up to make initiation and retreat easier to execute. You can swap this item for a Force Staff if you're dealing against heroes that can easily disable your [[Blink Dagger]. Can be considered a core item in some cases since it decreases the magic resistance of all the enemies affected thus increasing all the magical damage dealt by your team. Consider picking it up if no one else does and make sure to get it against heroes who are typically strong against magic damage. If you're in need of extra stats, health, movement speed and sustainability, this item choice can be really significant. Like Urn of Shadows, it's going to be convenient to heal yourself and your allies without going back to the base or to simply deal some extra damage to your enemies. However, this item is more special since it amplifies healing when used on your allies and it reduces healing when used on your enemies. This can be really strong against heroes like Omniknight who turn the tides with healing. In the ideal scenario the team's other support will buy the courier while you get the wards, but in case that doesn't happen then you'll have to sacrifice your early Wind Lace and get the courier instead. I know, but someone has to do it. Don't be greedy! Get this item whenever you're against heroes that can turn invisible. Make sure to use it efficiently and only when the enemies can't dispell it. Remember that invisible heroes revealed by dust are also slowed, keep that in mind and use it to your advantage. The best way to reveal invisible units and enemy wards. You can pick up this item in every game as long as you play carefully and you're certain you can't be killed easily. Make use of it for removing the enemy wards and securing as much map vision as possible. Get it faster if the enemies have multiple means of invisibility. Resort to sentries and dust if you can't afford gem. A very good item to avoid enemy vision and setup ganks. Since the stock is limited, make sure to use it carefully and make the most of each smoke. You can use it together with the second support in order to gank the other lanes without being seen. In the later stages, you can use smoke together with your team to infiltrate the enemy lines, plant wards and ambush the enemy heroes. If you're having a hard time gaining levels then buy tome whenever it's on stock. Levels are important on Dark Willow since her abilities become stronger with each point. If you're doing better than the other support, based on what hero it is, consider letting the tome to the other support if it needs it more. As soon as the game begins, make sure to place your Observer Ward in a good spot where it can help your team. As I've previously mentioned, I prefer to place it in a spot where our team can see one of the runes and a path from where the enemies could gank us. You can also use the Observer Ward on your lane to keep an eye on what your lane adversaries are up to. Remember that the enemies are also thinking where to plant their wards, try to either guess where they've placed theirs and remove them with your Observer Ward or simply check their inventories for wards and try to notice when and where they're planted them. Removing the enemy wards is as important as planting wards for your team. Don't forget, in most cases the team with the better vision wins the game! Moving on, let's talk about your lane and your carry. There are many scenarios that can happen and you have to adapt in order to be effective. If your carry is having a hard time farming and cannot deal with the enemy laners, you will have to stick by your carry, protect him and secure his farm. Make sure to use your Shadow Realm for harassment and whenever you want to initiate or protect your carry use Bramble Maze to disrupt the enemies. In some situations even Cursed Crown can work, but make sure to think about the stun timing since it's not that reliable. There may be cases when your carry won't be able to farm and you won't be able to do much about it, in this case the best option is to stack the neutral camps as much as possible for your carry to farm and recover the gold that's been lost in the lane. Let's imagine a scenario where your carry is doing fine and he doesn't require help. This is a great scenario since your lane is already won and you can move around the map to help your other lanes win. In this case, you can gank the other lanes by yourself or together with the other support. Usually it's best to focus on the mid lane, if you can get the enemy mid hero killed it will greatly help your team. If your mid laner is a snowball hero, helping him get some kills will enable him to get out of control and become a real threat to the enemy team. If the enemy team has a hero farming the forest, make sure to put pressure on him! Steal his bounty runes, steal his experience and his neutral last hits, do anything you can to make his game harder and to reduce his farm. Don't avoid ganking the enemy safe lane even if it seems difficult. Applying pressure on the enemy carry is great in any way because you're forcing him to play defensive thus losing farm and time. Play smart, be efficient, don't waste time! Make sure to always carry a Teleport Scroll in case your allies need help. It's very important to be map aware and to react to the enemy movements. If you see the enemies moving in to attempt to kill one of your allies, make sure to teleport in the vicinity and help! In many cases you can save your allies and get a kill. This will greatly increase the team morale as well, as not many people react with Teleport Scrolls. As the game progresses, you'll want to always be in the proximity of your teammates for two reasons: you can quickly help them if they need you and in the same time they can quickly come to your rescue in case the enemies will try to get you killed. Make sure in this scenario to use Shadow Realm to delay your death as much as possible to save time for your team to arrive. As I've mentioned before, I want to emphasize the importance of vision and wards. It's crucial at EVERY stage of the game to always have vision and to reduce the vision of the enemies as much as possible. Purchase Observer Wards and Sentry Wards and make this happen! If you don't have gold for them, don't feel bad to ask your teammates nicely to buy them for you, in most cases they will help as long as you place them. Remember to place your wards in places where the enemies don't expect it. They will be way harder to be found while they'll provide vision of areas where the enemies won't expect to be seen. I always carry on me at least one Sentry Ward just in case I notice an area is warded or if I spot an enemy hero that has just placed a ward. Let's not forget that it's also useful against invisible heroes and surprise Shadow Blades. Let's move on and imagine a scenario where you're in a team fight. First, it's important to know where to position yourself, as your abilities can be used from a really long range you'll want to stay somewhere safe, away from the enemy heroes that can kill you if they get close to you. Whenever there's an enemy hero that's dangerous and you want to drive away from his team you can use Cursed Crown, since it force the target to move away from their allies if he doesn't want to get them stunned as well. In the possible scenarios, the target either gets stunned alone or he gets his teammates stunned as well, both are pretty good scenarios. Whenever your enemies are piled up, chasing your teammates or are simply trying to escape, try to be as annoying as possible with your Bramble Maze, it can be used in many ways and the only limit is creativity. However, use it carefully! Its cooldown is quite long and you won't be able to use it that often in fights. If you're in a tough spot or if you simply need some quick burst damage, don't forget about your Shadow Realm! It can save you some time until you can reach a safe spot or until your allies come to your aid, but it can also be used offensively to nuke down enemy heroes, be versatile! As for the ultimate, I really like that you can adapt to different situations. For example, if you're dealing with a single target and you need to kill it quickly, you can use your Bedlam to do so, since it deals a good amount of damage with a 0.25 attack interval. In case the enemies are piled up and are trying to either escape, setup for a combo or simply chase down your team, you can use Terrorize to greatly disrupt them and ruin any plans that they had in mind. Always play with your team and for your team! Maintain map vision and control, only fight when the odds are in your favor, get objectives and don't waste time, sacrifice yourself for your cores and for the better outcome of the fights, play smart and have fun! Thanks you for reading and please let me know what if you have any question or suggestion! I hope you've enjoyed my fourth guide and I'll make sure to keep this guide updated as soon as the patches are released.